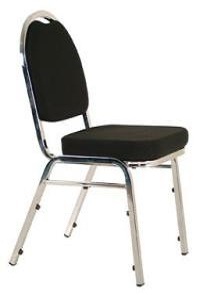 The Buro Banquet is a sturdy, comfortable stacking chair that looks good anywhere from restaurants to waiting rooms. Indicative maximum user weight 100kg. Indicative total sitting hours per day upto 4 hours. Hand hold for ease of movement. Quality chrome plated 4 leg frame.